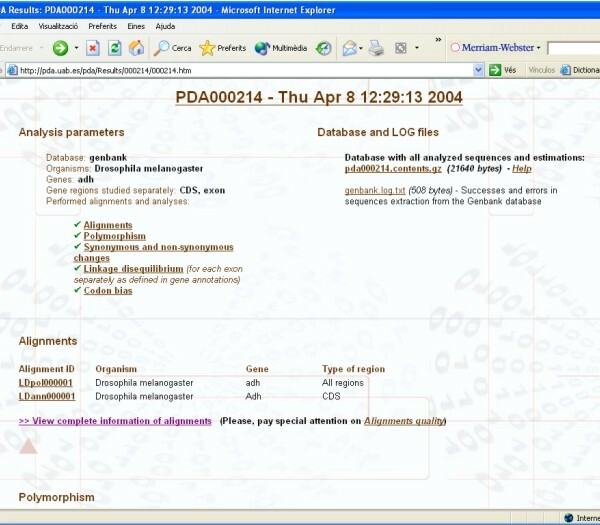 PDA has a user-friendly, web-based interface where the user can select the sequences to be analyzed and the parameters to be used. 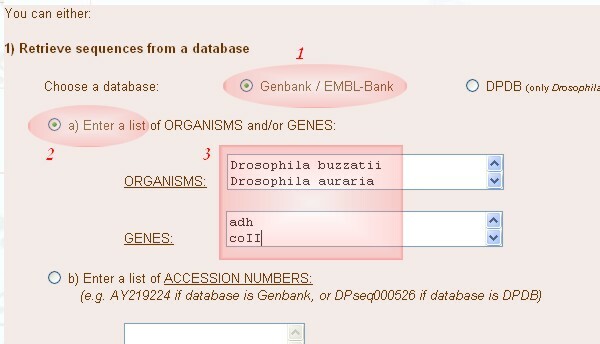 Sequences can be retrieved from either Genbank (http://www.ncbi.nlm.nih.gov/entrez/query.fcgi?db=Nucleotide; see the NCBI's Disclaimer and Copyright) or the DPDB database (http://dpdb.uab.es) as a list of accession numbers or a set of organisms and/or genes. Low quality sequences coming from large-scale sequencing projects (i.e. working draft), where most missing data is, will be excluded from the analysis. 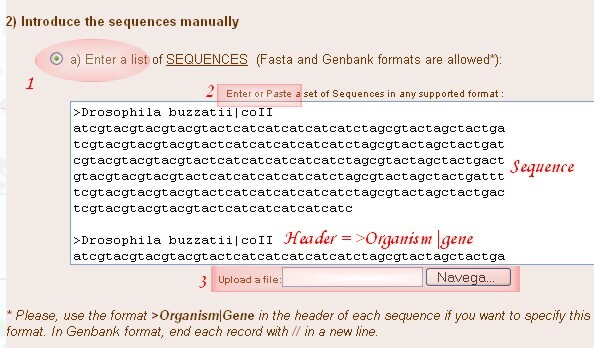 Alternatively, sequences can be introduced manually in Fasta or Genbank formats. All sequences will be grouped by organism and gene, and groups will be aligned using the ClustalW algorithm. After, different analyses will be performed. they will be given by yourself in Fasta or Genbank formats. AUTHORS Yang,Y., Zhang,Y.P., Qian,Y.H. and Zeng,Q.T. mitochondrial gene for mitochondrial product. PDA will analyze the performed alignments in terms of Polymorphism, Synonymous and non-synonymous substitutions (1), Linkage disequilibrium (2) and Codon bias (3) by default. However, you can disable the last three analyses. Linkage disequilibrium is estimated in non-overlapping sliding windows. You can choose the window length, which is set to 50 segregating sites by default, although the maximum value that will be used on the web is 100 consecutive segregating sites (be aware that windows may not be of the same length in nucleotides). 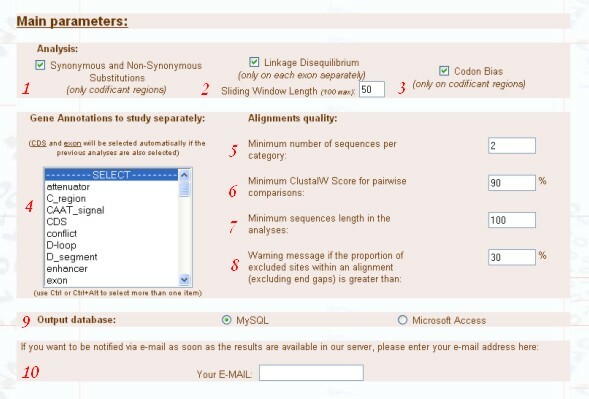 You can also choose which Gene regions you want PDA to analyze separately (4). 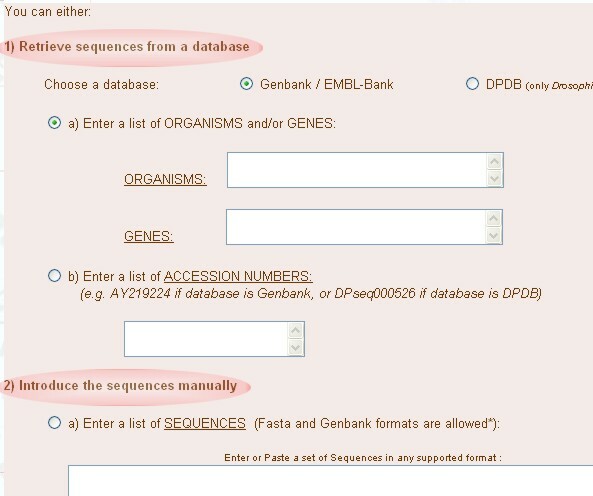 Regions are that of Genbank annotations, which is also used in the DPDB database. CDS and exon are chosen by default. The Minimum number of sequences per category is the minimum number of sequences you for alignment (5). Number 2 is set by default. The Minimum ClustalW Score for pairwise comparisons is the minimum percentage of homology between each pairwise sequences comparison in a final alignment (6). The aim of this parameter is to separate fragmented or incorrectly annotated sequences into different subgroups, but it is also very useful to separate, in different alignments, sequences of a same organism that come from well separated populations. Sequences are never used in more than one subgroup. The Minimum sequences length in the analyses makes the program to exclude those sequences shorter than the number of nucleotides written(7). 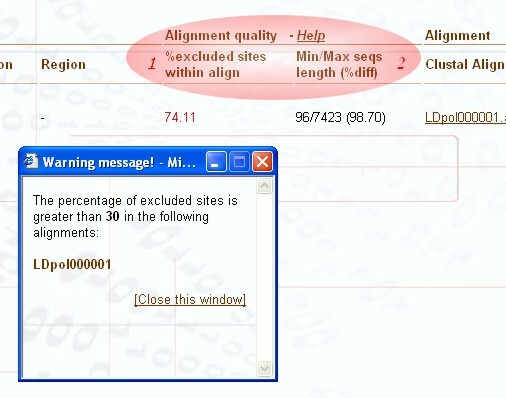 A Warning message will appear in the Alignments section if the proportion of excluded sites within an alignment (excluding end gaps) is greater than the introduced percentage (8). The results will be given in both HTML pages and in a relational database. This can be either in MySQL or Microsoft Access formats (9). Finally, you can introduce your e-mail address if you wish to receive a notification as soon as the results are available in our server (10). Note that this is not a required option because a unique ID will be assigned to your submitted job, and you will be able to retrieve the results using this ID. You will have to go to "Request results by ID" (at the top of the PDA Home Page) and introduce the unique ID in the box. Finally, you can modify the default Clustal parameters, although these have been optimized for polymorphism analyses. K-tup: Can be 1 or 2 for proteins; 1 to 4 for DNA. Increase this to increase speed; decrease to improve sensitivity. Window length: The number of diagonals around each "top" diagonal that are considered. Decrease for speed; increase for greater sensitivity. Score type: The similarity scores may be expressed as raw scores (number of identical residues minus a "gap penalty" for each gap) or as percentage scores. If the sequences are of very different lengths, percentage scores make more sense. Topdiag: The number of best diagonals in the imaginary dot-matrix plot that are considered. Decrease (must be greater than zero) to increase speed; increase to improve sensitivity. Pairgap: The number of matching residues that must be found in order to introduce a gap. This should be larger than K-Tuple Size. This has little effect on speed or sensitivity. Gap open: Reduce this to encourage gaps of all sizes; increase it to discourage them. Terminal gaps are penalized same as all others except for END GAPS not being selected. BEWARE of making this too small (approx 5 or so); if the penalty is too small, the program may prefer to align each sequence opposite one long gap. End gaps: Here you can select if you want the terminal gaps to be penalized or not. Gap extension: Reduce this to encourage longer gaps; increase it to shorten them. Terminal gaps are penalized same as all others. BEWARE of making this too small (approx 5 or so); if the penalty is too small, the program may prefer to align each sequence opposite one long gap. Gap distances: Penalization for the distance between gaps. First, PDA groups the sequences by length, so that sequences in the same group must not differ in more than the 20% of their length. 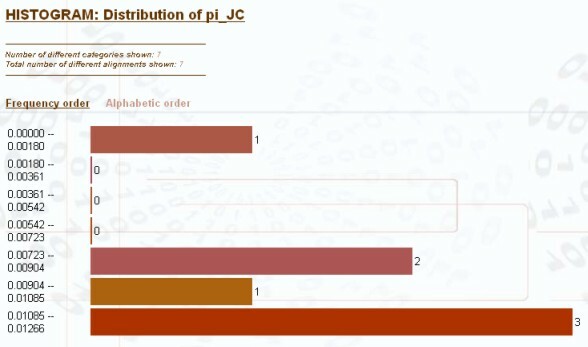 It calculates the amount of informative sites in each accumulative group of sequences (e.j. group 1 (longest sequences), groups 1+ 2, groups 1 + 2 + 3, etc.). PDA will use the set of sequences with the largest number of informative sites (in some cases discarding the shortest sequences). Therefore, we will have more informative sites by using the four long sequences only and discarding the short ones. PDA would show the alignment with all the sequences, but would use the four long sequences only to calculate the polymorphism estimates (n = 4 in the results). ● for sequences that were NOT included in the estimates. You can find this information in the ALIGNMENTS page. The output of the program is stored in our server ofr a week. It includes a set of HTML pages with the results of the alignments and analyses, as well as a database with the same information but also all the sequences used and their annotations. % excluded sites in the alignment (due to gaps or ambiguous positions). If the value is greater than 30% (or the user defined value), a warning message will appear, and the value will be marked in red. Averages of the main statistics for Polymorphism, Synonymous and non-synonymous substitutions, Linkage disequilibrium and Codon bias, by gene regions (including all the studied organisms and genes). You can view the complete results for each alignment by clicking on the appropriate "View complete "Analysis" results" link. The proportion excluded sites within an alignment due to gaps or ambiguous bases (end gaps will not be taken into account). Should this number be greater than 30% (or the user defined value), it will be marked in red and a warning message will appear in a small window. 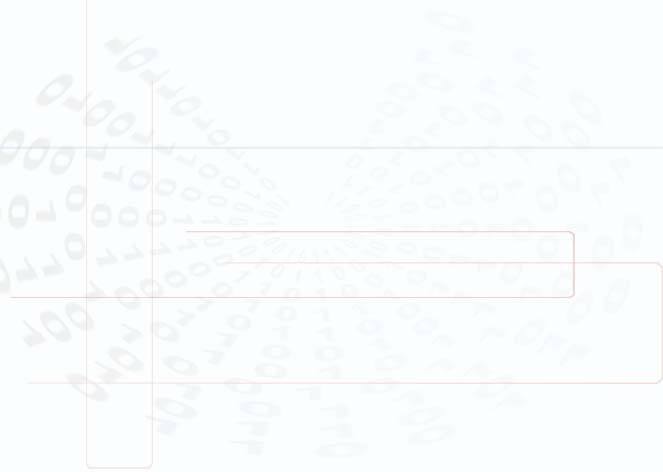 If it reaches the 100%, no analyses will be performed on the alignment. You can find these parameters in the Alignments section of the HTML output, or in the Index_Analysis table of the database. The source code of PDA can be downloaded from our FTP site under the GNU General Public License (GPL) and be used locally. This is highly recommended for big analyses. Please, go to the section "Download Source Code" and register in order to obtain a username and password and get access to the FTP server. See the Installation file that comes with the distribution or that can be downloaded here (1,238 KB) for specific instructions on how to use the program locally.